That says a lot about this soup because my mom has very strict criteria for recipes that make it into her rotation. They have to be quick to make with minimal prep, they have to be easy enough to eventually memorize (because cooking goes faster that way), and they have to be either batch-able or freezer-friendly so she can eat them for multiple meals. Right now, her regular rotation includes this Butternut & Cauliflower Vegetable Curry, the Brussels Sprout & Coconut Rice from our first cookbook, and after today… this lentil soup recipe. I’m sure she’s making her shopping list as you read this. It’s made with pantry ingredients like dry lentils, canned tomatoes, onions, garlic, and spices, so it’s easy to whip up without a trip to the store. It’s creamy and comforting, thanks to the coconut milk – perfect for chilly winter nights. With a pop of lime juice and ginger, this cozy soup has bright flavors that keep it feeling fresh & light. It comes together in just over 30 minutes (and most of the time is hands-off simmering), so you can enjoy it any night of the week. It freezes well! Make a big batch to keep on hand for busy weeknights or weekday lunches. Great for meal prep. 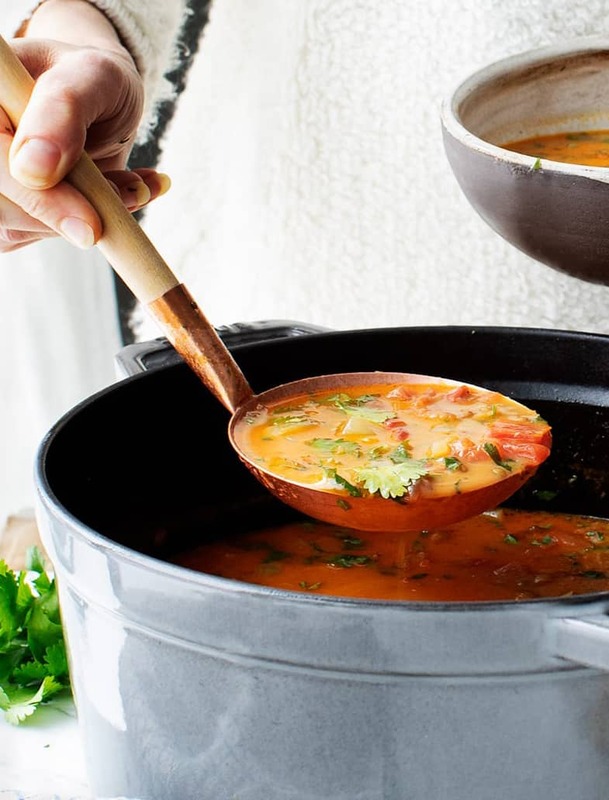 For how flavorful this curry lentil soup is, this recipe is simpler than you might think. Start by sautéing onions over medium heat, and then add ginger, garlic, curry powder, and red pepper flakes and sauté a few minutes more. Next, stir in the tomatoes, lentils, water, coconut milk, sea salt, and freshly ground black pepper. Simmer until the lentils are tender, about 25 minutes, and finish the soup with chopped cilantro and a hefty squeeze of lime. As I mentioned above, I love how this vegetarian lentil soup is made with mostly pantry ingredients. It includes two of my favorite ingredients to keep on hand: French green lentils and diced fire-roasted tomatoes. 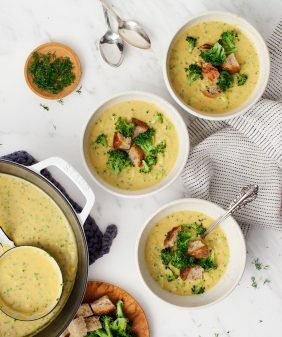 Unlike brown lentils or red lentils, which often become mushy, the French green lentils hold their shape well in this soup, giving it lovely texture. They’re also a great choice for lentil salads, so they’re a staple in my pantry. Recently, they’ve stopped showing up at my grocery store so I buy them in bulk online which is really convenient because now I always have them in the pantry. Diced fire-roasted tomatoes give this vegan lentil soup a smoky depth of flavor. They’re an excellent addition here, but I like to use them anytime a recipe calls for diced tomatoes. Try them in this lasagna or this spaghetti bolognese (it uses lentils, too!). 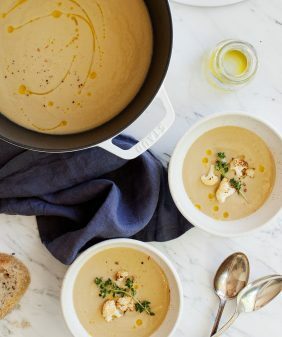 If you make this lentil soup recipe, please let me know how it turns out for you in the comments! I hope you love this recipe. Heat the oil in a large pot over medium heat. Add the onion and a pinch of salt and cook until soft and lightly browned around the edges, 8 to 10 minutes, reducing the heat to low as needed. With the heat on low, add the garlic, ginger, curry powder, and red pepper flakes and cook, stirring, until fragrant, about 2 minutes. Add the tomatoes, lentils, water, coconut milk, ½ teaspoon salt, and several grinds of black pepper. Bring to a boil, cover, and reduce to a simmer, stirring only occasionally, until the lentils are tender, 25 to 35 minutes. If your soup is too thick, stir in ½ to 1 cup more water to reach your desired consistency. Stir in the cilantro and lime juice. Season to taste and serve. 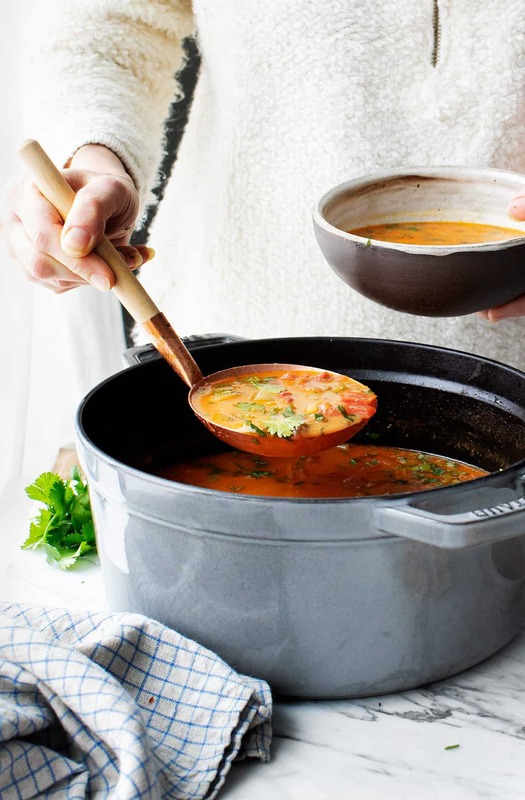 Store leftover soup in the fridge for up to 4 days. If it thickens too much in the fridge, stir in a little water while you reheat it until you reach your desired soup consistency. This soup also freezes well. This looks amazing and easy – I have similar priorities to your mom! If I only have regular diced tomatoes on hand, is there an easy way to replicate the fire-roasted flavor? It’ll work with regular diced tomatoes! There are a lot of other flavors going on here (the curry, ginger, garlic)… I’d just season to taste at the end with maybe a bit more black pepper and/or red pepper flakes depending on your spice preference. You could use smoked paprika. I love this recipe and it makes me hungry! When should I add the lentils and water to the pot, before I add the tomatoes or after? all together in step #3 of the recipe. I hope you enjoy! This looks delicious! I’m a new vegetarian and I don’t know what is the best coconut milk to buy. Can you please recommend one? Thank you! Anxious to try this recipe. Hi Denise, any full-fat can of coconut milk will work here. Just avoid the cans that say “light,” and avoid the beverage type of coconut milk that’s in cartons because it’s not as rich and creamy as the cans. I find canned coconut milk in the asian aisle of the grocery store: the Thai Kitchen brand is usually in any store, I also regularly use the 365 Whole Foods brand as well as Trader Joe’s coconut milk. Love this recipe. A riff on my lentil soup recipe. I have some spinach and was thinking of adding it at the end. Any thoughts? I think spinach would be a great addition! I regularly make curry and also tomato soup. So I will combine that idea using your recipe. I am sure it will be delicious. Thanks! Hi Anthony, I hope you love the combo! 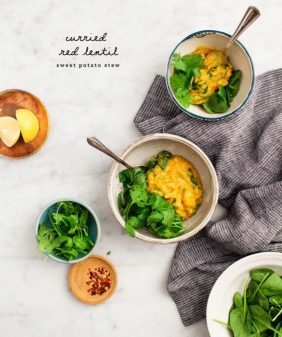 As I have been a curry ‘freak’ most of my life and lentils are my best friend this soup is most attractive especially with the colder months approaching Down Under. I presume your green lentils are what we here call Puy lentils . . . our very new Amazon seems to keep what you have used anyways 🙂 ! Usually mix my own curry spices but a ready one would simplify: for me I think a medium !! Hi Eha – yes, Puy lentils are the same, thanks for the note, I’ll add that to my description. 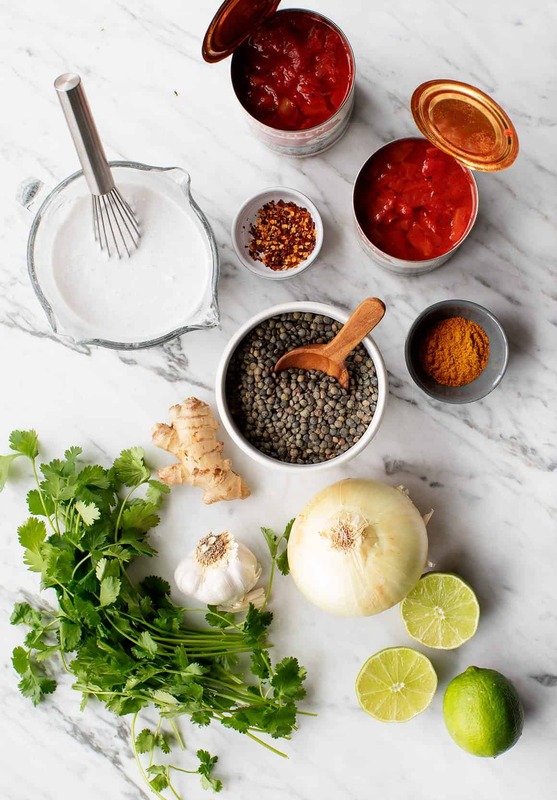 I usually like a homemade curry mix too, but the pre-made kind flavors this recipe perfectly! I made this last night. It was so good. I did add a few extras…. spinach, potato and 1/2 cup of quinoa. It was more of a stew than soup. But so good. Thanks for the recipe! Hi Julie, that sounds like a wonderful stew! I love the idea of adding quinoa to thicken it even further. I made this recipe last night and it was not only easy, it was delicious too. I ran out of my beloved fire roasted tomatoes, but regular canned diced tomatoes worked just fine too. Can’t wait to make it with the fire roasted ones now! Everyone in the family loved it. Served it with some brown rice pilaf. Hi Frances, I’m so glad it was a hit with the whole family! I’ve now made this 3 times since I first discovered it and it continues to be a big hit with my husband and 10 year old. I even added 16 ounces of fresh spinach that needed to be pushed and they gobbled it up. Delicious! This soup is FANTASTIC! I made it last night, substituting vegetable broth for the water, then added a carrot for additional texture and taste. Definitely use the full-fat coconut – it’s worth every single extra calorie. This soup is healthy, rich, filling and absolutely delicious. Can’t wait to make it again. Hi Judy, I’m so glad you loved it! I made it last night, with a couple of modifications. I used reduced fat coconut milk and added sweet potatoes to it. I also added some caraway seeds as garnish. My husband and I loved it. I think the sweet potatoes were a strong addition, the caraway seeds were also tasty but I would say further “complicated” the already complex flavor. This one’s going to make it into regular rotation! Thanks! Delicious! Served with some crusty bread and had a great meal. Thanks for creating and sharing! Hi Andrew, I’m so glad it was a hit! Made this for supper, it was easy, fast and delicious. Thanks for a great recipe. Hi Mary, I’m so glad you loved it! I live at elevation and green lentils take forever to cook – like HOURS – do you think pre-cooking the lentils in an instant pot then using cooked lentils in the recipe would work as well? Or follow the recipe to step 3 then pressure cook the right amount of time for the beans instead of boiling/simmering? Hi Debbie, I would add the cooked lentils halfway through the simmer time in step 3. Let me know how that goes! This soup was incredibly delicious! Easy, hearty and satisfying. Definitely a keeper. I made this and doubled the batch and shared with my 84 yr old mom (as I cook for her every week). She loved it as it was very different than anything I’ve made for her. It’s like a super food in a pot! Delish! Just delicious! Please keep all your great recipes coming! 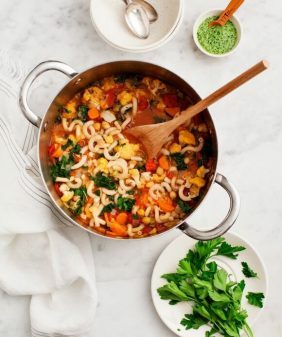 This soup is delicious and soooo easy. I was a little short on the cup of lentils, but had some mushrooms I needed to use up, so added that as well and it tasted great. My two year old daughter even liked it! I made this last night for my family and we all loved it! It was a great meal for a cold and rainy winter day. I loved the variety of flavors. It was delicious. I used the curry powder that you suggested and I added a 1/2 teaspoon of cardamom because I love the taste of cardamom. I will definitely be making this again. Thanks for the recipe! Hi Gil, I’m so glad this one was a hit! I made this soup on Monday and I must say that it is just delicious. The best combination of Tomato soup married to a mild Curry. This will be my go-to Tomato soup from now on. I made it exactly as the recipe was written and had no problems at all. Thank you! I forgot to rate it. It gets 5 stars. Thank you, I’m so glad you loved it!! I try my best to not ask about substitutions, but I just found out I have a ton of food intolerances that include coconut. Dang! Do you think this soup would taste as good with regular milk? I know it would technically “work” as a substitue but coconut milk is so tasty in curried recipes. Hope that helps! So sorry to hear about your intolerances! I had all these ingredients on hand, so it really is a pantry recipe! I doubled it (we area family of 7 at dinner) and added so e smoked sun-dried tomatoes as I only had 1 can of fire roasted tomatoes. It worked great. Thanks for this flavorful and easy recipe… Was easy to make Sunday afternoon! Hi Ariel, I’m so glad everyone loved it! Thanks for coming back to let me know! Really yummy! I added some chopped fresh spinach and served with naan and it was a hit. I didn’t add the red pepper flakes, and used no spice curry powder and it was still “too spicy” for my little kids (eye roll), so next time I might do half fire-roasted tomatoes and half regular diced. Thanks! Hi Laura, I’m glad you enjoyed it! Hi Susan, I’m so glad you loved the recipe! This is definitely one of my top 5 soups. Thanks, Jeanette! I’m so glad you loved it so much!! This soup is perfectly delightful. Made substitutions based on what I had on hand (regular diced tomatoes for smoked, whole black mapte beans for French lentils, homemade lard for coconut milk – also added a dollop of sour cream to bowls) and it was a huge hit. Adding this to my regular rotation. Will make excellent lunches. Thank you so much! Hi Kristin, I’m so glad you loved it and that it was so flexible! We just finished our 2nd quart of this soup that I canned from a double batch I made earlier. 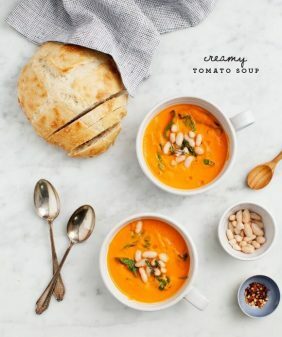 Coming home from our weekend cabin after we’ve been working/finishing it to a nice bowl of this soup and some naan I had stashed in the freezer, made us so happy and contented. MUCH better for us than snagging a pizza on the way home 😉 I can’t wait to try some of the other soups!! Hi Maxine, I’m so glad this one was such a hit! Let me know what other soups you try! This soup is to die for. My husband, mother, sister and one-year old all LOVED it. Hi Alyson, I’m so glad your family loved it! I’ve made this twice, and absolutely love it! Not only does it smell DELICIOUS while simmering, but it also is so simple to make. Better still, it’s absolutely one of the tastiest lentil soups I’ve ever had. Thanks for such a great recipe! Thanks Audrey, I’m so glad this one was fun to cook! I had some cooked lentils in the freezer, so this was a perfect soup to make with things on hand. It was quick and tasty! I’m so glad you enjoyed the soup! I’m not a fan of green lentils, but like red and brown. What would you recommend in this case? Either would make it a more mushy stew (which isn’t necessarily a bad thing, it’ll just be more stew-like). The green lentils keep their form better, which is why I prefer them in this soup. 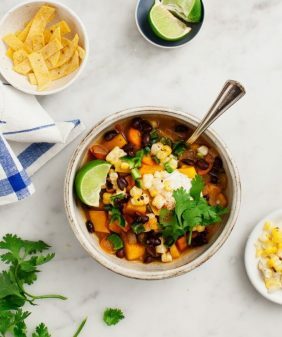 They take on the flavors of the soup itself, so I’d suggest giving them a try, you will probably like them in this form! Made this for dinner last night and it was SO good!! Love adding vegetarian meals into the mix. Especially when they’re this flavorful! Made this soup for the first time last night. Was easy and it’s delicious! Keeping this at the top of the favorite recipe stack for a go-to soup. My husband loved it too! I’m so happy to hear that you both loved it! I made it and it’s off the hook!!! Thanks for a great recipe to add to my go-to list! Hi Lauren, I’m so glad you loved it! Yay!